Samsung's latest Unpacked event kicked off at 8am PDT, 11am EDT, 4pm BST and the South Korean firm unveiled its latest phablet - the Samsung Galaxy Note 8. If you want to see what happened, check it out below, join our live Q&A or just have a read of our thoroughly detailed, possibly too extensive, hands on: Samsung Galaxy Note 8 review. 11.53 - Right, we out. Everything you need to know about the phone is right here, in our Samsung Galaxy Note 8 release date, news and features hub. Hang on. I've spent too long listening to the Note 8 conference. I'm getting out of here. No, wait, they've all danced off the stage. 11.50 - I think it's finishing now. He's walking off. There's a video. This guy bought the Note 2 and her Note 3 but missed the Note 4 and he regrets that. DID HE GET THE NOTE 5? The 7? What happened after? All the people are being shown the new Note 8, and they've turned the cameras off so people can't see it. But it's just been launched. What? 11.49 - There are 'new stars in the Samsung Galaxy' coming at IFA next week... that's definitely going to be a new watch, plus more on the Note 8. 11.48 - The Samsung Galaxy Note 8 release date is 15 September, and pre-orders begin today or tomorrow, depending what country you're in. And it comes with AKG headphones in the box... with a normal headphone jack! Wonder what that's about, eh? 11.47 - It's water resistant as well, up to IP68, and it's wireless charge-compatible. 'As for the competition? Let's just say... they're trying to catch up'. That's fair. None of the other big players aren't doing the same thing with wireless charging... it'll be interesting to see what Apple does. 11.46 - There's 64GB on board, but you can also expand the memory using a microSD card up to 256GB. (Or one week of selfies, according to Denison's 12 year old. He needs to have his phone taken off him once in a while). 11.45 - 'We've set a new standard for the smartphone industry.' That's a bit much, but this is a pretty powerful phone. Better than any Note Samsung has ever made... which you'd hope for, really. 11.44 - JD IS BACK! (Justin Denison). 11.43 - They're collaborating over how well the picture in Lightroom is exposed...seems a bit weird to me. Just do it yourself, buddy. You can do this. 11.41 - Jon uses DeX at home and the office. He strolls down the Highline each day and doesn't take a laptop. You can have a video chat with people using Zoom to video conference then keep it going when you get into the office... that's never going to happen, come on. 11.40 - Now we're onto DeX, the dock where you can use the phone to do productivity stuff and then click it in to a large screen and mouse without an issue. We've seen this, and it's pretty rapid and could be a good laptop replacement... if you carry the phone around with you a lot. 11.39 - Bixby is going to work with Spotify - and there will be more announcements at the developer conference in October. Bixby really needs more apps supported, so this is a good move. 11.38 - Oh, he's giving another example. Night mode - sets alarm, filters the screen, puts it on do not disturb. But... what if someone sees you say goodnight to your phone? Another human notices you doing that? 11.37 - There's not a lot of new things on offer here for the Samsung Galaxy Note 8 and Bixby - it's just launched at the time when the Note 8 came out. One of the new things, though, is the ability to set shortcuts, giving a simple command to do a lot of things at once. Be it changing the screen quality or taking a kind of picture and saving it to a pre-defined album. 11.35 - It's Jon Wong on stage now - director of product marketing at Samsung US. He's chatting about Bixby and Dex. 11.34 - The S Pen can also translate whole sentences for the user. That got a clap. 'It can also convert units of measurement!' Pause for clap. No clap. The audience went too early. 11.31 - Next up is Live Message, allowing you to take a picture and the sketch on it. Said sketches are then animated as GIFs to send to friends in real life, real time, realsies. She likes the 'Sparkle Pen' format. Cool. She says it's cool so it's cool. Screen off memo is back, but you can keep writing and writing and writing for pages without turning on the screen. 11.30 - Now we're hearing about Pen Up, the place where users can share their S-Pen-created images. Ooooh, coloring book templates. That actually is nice. COME ON, coloring in is cool. Right... right? 11.29 - Samsung's ability to change the focus after the shot is cool though - that may confuse some people, but the Note user is generally a bit more technically savvy, so it should be OK.
'You never need to worry about charging or pairing the S Pen.' ZING! 11.27 - Samsung is making it sound like it's invented background defocus instantly. When in reality the new thing is live background defocus (called Live Focus) where you can see in real life how much blur you have. You can do this before or after the shot though, so there's no pressure. The demo was a bit embarrassing - the audience is clapping a defocused picture. 11.25 - We're onto the camera now - the Note 8 has a dual camera. One is a tele-lens, and the other is wide-angle. And both have optical image stabilisation. *Hey Gareth, 1995 called, it wants its terrible callout back. 11.23 - Our favorite colors are on display. Samsung is telling what they are: gray, black, blue or gold. (Sorry, Orchid Gray, Midnight Black, Deepsea Blue and Maple Gold. Obviously). 11.21 - Denison is having a lovely time explaining about how he's addicted to caffeine. He's talking about how the Note just fits into his life - with the large screen to see what's happening, multi-tasking with the split screen, and how you can open two apps at once when swiping from the left. 11.19 - Samsung is really going on about the community, about how the fans push Samsung to keep doing more stuff. Confirming the Infinity Display to the Note 8. In a preview, it was clear that the edges of the Note are even more aggressively curved, to give more space to write (according to Samsung). It's still got the same 18:9 (ish) ratio too. 11.18 - 'You're not just dreamers, you're doers.' He just gets me. 11.17 - It's Justin Denison, Senior VP of product strategy on stage now. 'It's great to be back at Unpacked to tell you about the Note 8.' He doesn't sound excited. Samsung would have to walk on water to make the Note 8 a viable buy. It’s CEO did just that. 11.16 - While we're watching more dramatic, dark scenes of people holding styluses, here's how the Note 8 compares to Apple's best, in our predictably-titled Samsung Galaxy Note 8 vs iPhone 7 Plus. 11.13 - We've still not seen the Galaxy Note 8 yet, despite loads of coverage going live across the internet. FYI - it's basically the Galaxy S8 Plus, with a 6.3-inch screen, 6GB of RAM and a dual camera, along with an enhanced S Pen. Oh man, I just wrote all that and now it's been announced. THE GALAXY NOTE 8 IS REAL! (Wait... there's loads of flashing lights and dramatic music first.... NOW it's here, as Koh has just run on stage with it). 11.12 - Koh is now talking about how Samsung was the first to be IP68 rated, with wireless charging and have iris scanning. This feels like lightly-barbed comments about the iPhone 8 that's expected to have these features. 75% of users say the Note is the best phone they've ever owned. Doesn't really seem enough, thinking about it. 11.07 - DJ Koh is on stage, and he's talking up the new phone - we just haven't heard which one it is. (It's the Note 8. Here's our hands on: Samsung Galaxy Note 8 review. Sorry to ruin the surprise. 11.05 - The fun has started - and fair play to Samsung, as it's just done a big section on how it has messed up with the Galaxy Note 7. It did say how much people were sad to have lost a great phone, but still, it referenced it. 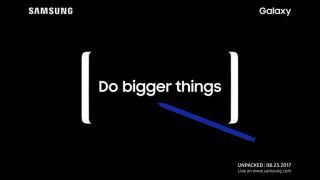 10:45am - You can tune in to watch the livestream of the Galaxy Note 8 Unpacked event below. 10:10am - We're now waiting outside at the Samsung Unpacked event in New York. Only an hour left to go until we get to see everything we need to know about the Galaxy Note 8. Here's what the queue looks like for the Samsung Galaxy Note 8 launch. 7:40am - We've just published an interview on Samsung's Bixby tech with Injong Rhee, Executive VP and Head of R&D, Software and Services for Samsung Mobile. In the feature, Rhee explains his vision for the new voice assistant technology and how he hopes it will change the way you use your phone. You can read the full interview here. 7:15am - Samsung's Galaxy Note 8 price has leaked with Carphone Warehouse putting it live early and says it's £869. That matches previous leaks we've seen and also suggests the phone will cost about $950 in the US and around AU$1200 in Australia. 4.30am - The sun is yet to rise over New York, but anticipation is already high as the world eagerly awaits the arrival of the Galaxy Note 8. Samsung will hope it's banished the daemons from the Galaxy Note 7 fiasco, with a forward looking focus for its latest big-screen smartphone. Join us straight after the event too, as we'll be doing a live Q&A on YouTube to answer all your questions on Samsung's latest big reveal.